An old Tuscan farmhouse on the edge of the largest protected area of Tuscany, Foresta di Monterufoli. The house has been thoroughly restored preserving its original character set amid the breathtaking scenery of the Tuscan hills with views and sunsets never to be forgotten. 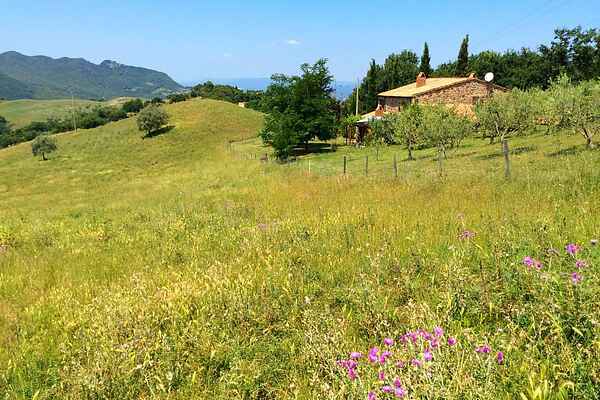 This beautiful natural area with small rivers and varying views lends itself very well to fantastic walks from the house, but also the rich culture in cities like Florence (110 km), Pisa (100 km), Siena (60 km), Massa Marittima (40km), Volterra (30 km) is within reach. Even the smaller towns and villages often on hilltops around are very worthwhile. Beach lovers find a beautiful sandy beach after a scenic tour of approx 45km. Montecerboli, the nearest village is at 5 km. There are a post office, bancomat and a number of small shops for daily needs. Much more opportunities for shopping you'll find in Pomarance at 12 km. Here there is also a large weekly markt. If necessary sheets etc. can be hired on site We have bought a DVD player! Around the house: Large herds of hundreds of sheep, guarded by white dogs (Maremma shepherds) come along every day. Near the house is a small lake where wild boars drink at night . Furthermore, porcupines, foxes and deer. In spring fireflies and nightingales. Trossa river is within walking distance from home (30 min). where the landscape is totally different (maquis). Close to home Volterra, which has grown by editing alabaster. At night it's so dark that you can see the Milky Way. Foresta di Monterufoli largest protected area in Tuscany, with unique flora and fauna within walking distance (45 min). A little further from home (<25 km): In addition to the fantastic cities (such as Siena, Florence, Pisa, Volterra, etc.) and numerous small towns on hilltops, all very worthwhile, is the area of ​​the colline metallifere with its special geological interests (volcanic geysers, such as in Iceland). Larderello is the center of the geothermal energy. Here is electricity generated by hot steam from the earth. There is also a swimming pool heated by geothermal energy. Sasso Pisano has a stream of warm water and Lagoni Rossi (and other places) you will find little geyser of very hot steam spewing up from the ground with great force.